An art tutor at National Star has been named special needs arts teacher of the year in a national awards. Louise Adams, whose childhood ambition was to be an art teacher, was honoured for going ‘above and beyond’ her normal teaching duties at the Unique Art Awards in London. Louise has worked at National Star in Cheltenham for 19 years. Thanks to her win, National Star received £2,000 from the Mouth and Foot Painting Trust Fund, which runs the Unique Arts Awards. After completing her degree in fashion textiles, Louise destroyed all her course work and took a job as a sewing machinist in a factory. ‘I was disillusioned with the art world and I needed to work, which is why I ended up at the factory. A friend asked me what I used to want to be as a child and I said “an art teacher”,’ said Louise. She went back to college to get her teaching qualifications and when she learned about National Star, Louise applied for a job – and got it. 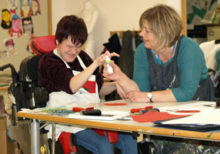 Every day she works with young people with complex disabilities and learning difficulties, teaching them to do everything from felt-making and clay sculpture to painting and glass making. ‘The students inspire me. I have learned a lot from them, I’m a better person because of them,’ said Louise. The Unique Art Awards, which is now in its third year, was launched to encourage young people with disabilities to develop their creativity.